Better Off Friends was such a pleasant surprise. I've read a couple of Elizabeth Eulberg's previous novels, and while I thought they were cute and fun, they weren't as addicting as Better Off Friends. I was going through a reading slump and started Better Off Friends in the hope that it'd be a fun, quick contemporary read, and luckily I was right. I blew through this in a day and even put off doing schoolwork so I could keep reading. It was such an adorable story! As far as contemporary novels go, I think this one has such a unique premise. I love the way Eulberg tackles the question of whether guys and girls can ever really be just friends. And despite the fact that this sounds like a very lighthearted read, there's also some serious moments. Levi and Macallan's friendship is tested at times, and there's also some great lessons about family throughout the story. Eulberg does a wonderful job of balancing the light and dark moments. Something else I liked is the way the story spans so many years. It starts when Macallan and Levi are in middle school and ends when they're in high school. This is definitely something you don't see often in YA books, and I was so impressed with the way Eulberg handled it. The pacing is perfect - it never lags or gets confusing. And the dual points of view added the perfect touch. Also, Macallan and Levi have such an awesome friendship. Yes, their love story is full of swoons, but they were best friends first and I think that's so sweet. They love the same TV show, stick up for each other no matter what, and banter back and forth. The dialogue between them constantly made me smile. Their character development is well-done, too. Levi really grows up throughout the story and he's very funny and likeable. But I liked Macallan a little better; she's so confident and unafraid to stand up for her beliefs. She was a lot stronger than most YA heroines. I'm so glad I had the chance to read Better Off Friends. Elizabeth Eulberg's writing seems to improve more and more with each book. She's definitely an author to watch! 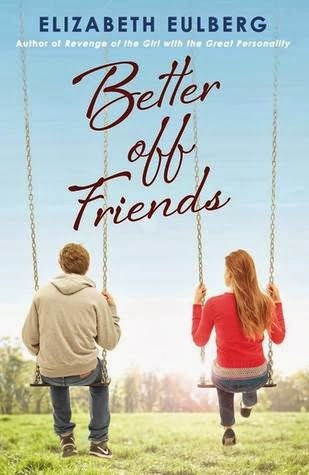 Better Off Friends is a must-read for anyone who's in the mood for a sweet, swoony contemporary read.